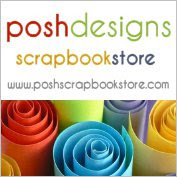 Hello Scrappers - it's time for another product review. 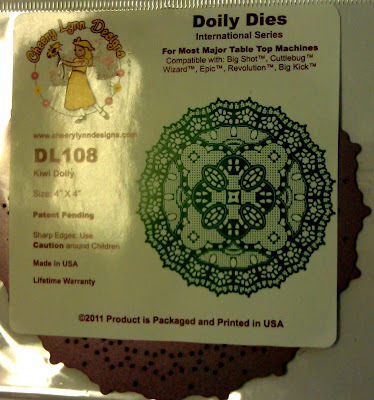 Today I picked up a new (well new to me, I guess they have been on the market for a while) product called the Doily Die - it's by a company called Cheery Lynn Designs. 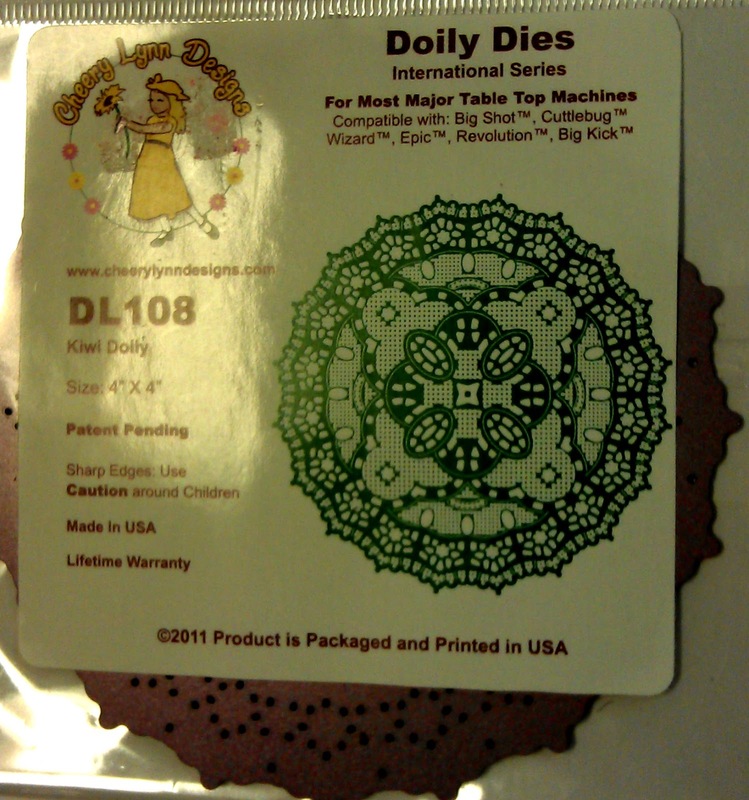 This die is VERY intricate and has a lot of detail to it. 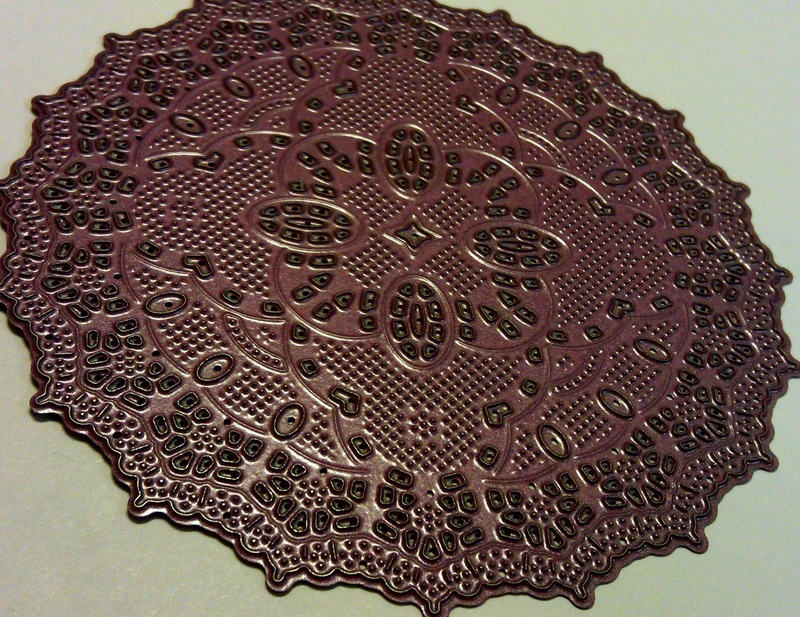 It is about 4x4 inches so it's a decent size, made of metal, so it's similar to the Spellbinders dies. However; due to it's hundreds, and do I mean HUNDREDS of itsy bitsy little teeny weeny die cut parts it takes several passes to get all of the cuts through the paper. 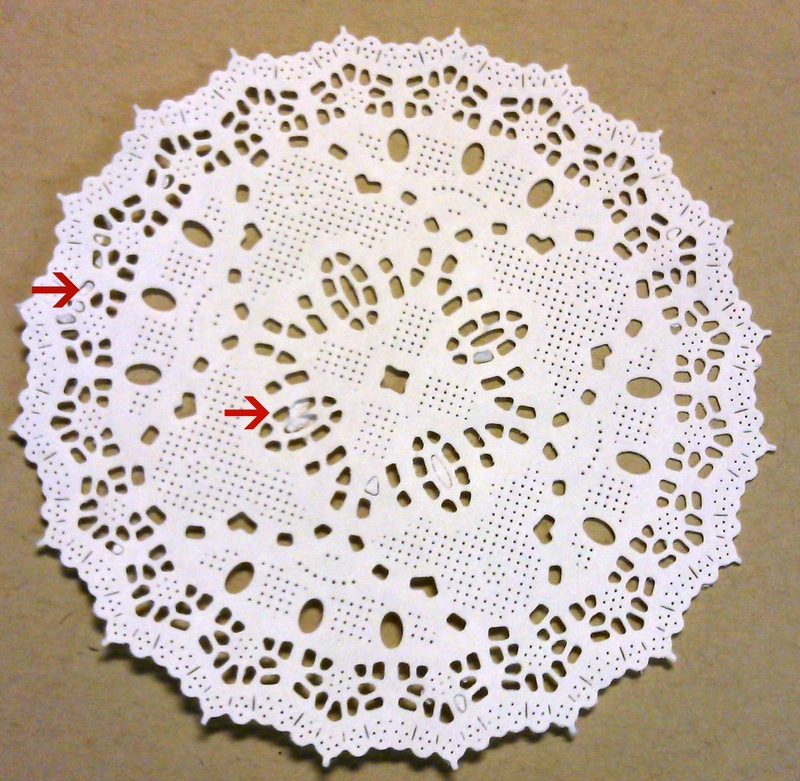 Oh yes, and that's another thing ... use paper, don't attempt this with Cardstock, it's simply too thick and you won't get the detail that you are expecting. I do suggest that you read the instructions first before attempting to use this die. The manufactures recommend that you use removable tape, and I found that you need it in more than just two or three spots, I found that 5 pieces kept the die from moving around on the paper. I also recommend watching their YouTube tutorial. They recommend several passes in your die cut machine, and rotating the die. I ran the die and paper through my Big Shot 3 times, and rotated the die 45 degrees once. On the video they ran it through about 5 times, and rotated 3 times. I found that it doesn't cut as well as a spellbinder, maybe a few more passes would have resolved that. I'm also a firm believer of practice makes perfect - I will get better at it, they will turn out nicer, I'll play around with different 'sandwiches' and passes and turns etc. I did find that the paint that they use to enamel the die transferred a little to the paper, but I think that might lessen in time as well. 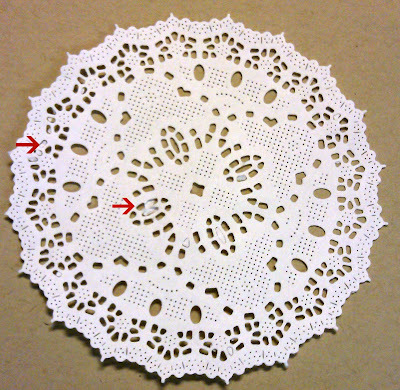 You will notice on my Final Result photo that there are a few spots that I wasn't able to get the pieces out without tearing the rest of the doily - a little discounted. Overall would I recommend this die cut ... I'd say I give it a 7 out of 10. Its not an easy tool, but the results are stunning! If you can get over the multitude of confetti it creates in your studio, and the time it takes to get all said confetti out of the die (I recommend a stiff bristled dry paintbrush) Not sure it's worth the $25 price tag, but it sure does make a pretty doily (but then again so does the dollar store) That's the frugal scrapper coming out in me I guess. But the trend spotter in me just had to have this new tool. 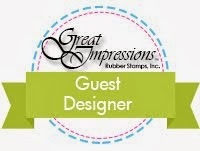 If you have tried this product or have questions or comments I would love to hear your feedback too. Comments are free - and they can be anonymous too if you wish. WOw what a gorgeous result from this die! Thanks for stopping by the Core'dinations Blog! Did you use the cuttlehug shim? I have heard that that makes a load of difference. I haven't tried any of these myself, but I wish I could get my paws on one to try myself before buying! I have a cuttlebug and I have tired shims tape everything and it just will not cut.I'm very disappointed and will not be purchasing any more of their dies which is to bad,because they are very pretty.